Tom Bower, whose unauthorised "Rebel Prince" biography of Charles was published earlier this year, said the prince was intelligent, kind and sensitive but also selfish, ungrateful, and a lover of luxury whose stubborn streak could risk the institution itself. 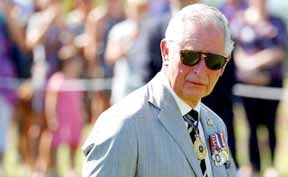 "I think Charles will try his hardest to be a good king," Bower, who describes himself as a committed monarchist, told Reuters. "The question will be how he behaves, whether he abandons a lot of the qualities that were shown in the preceding 20, 30 years. "I do believe the queen and (her husband) Prince Philip have been thankful to live so long to prevent their son being the monarch because he would have jeopardised it." Such critical portraits of the prince are not new. Since the public breakdown of his marriage to Princess Diana in the 1990s, his lifestyle and views on issues such as climate change, religion, alternative medicine and architecture have often had unfavourable treatment.